With an imbalance today between national government funding and the growing demand to update basic public services like water, power and transportation, our major global cities are challenged more than ever to look creatively at funding solutions for infrastructure. Private sector involvement is a key strategy, and it is manifest in the use of public-private partnerships (P3) in many countries around the world. In addition to being an important source of new capital for local governments, private investment through P3s motivates accountability in delivering critical public assets, stretches tax dollars and helps cities deliver projects faster and cheaper. 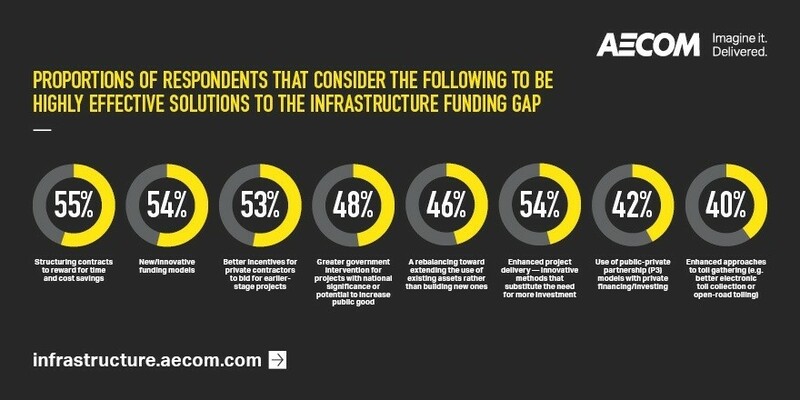 In AECOM’s The Future of Infrastructure (2018) report, which surveyed more than 500 infrastructure decision-makers from around the world, a majority agree that innovative funding models like P3s are highly effective as a way to mitigate a shortfall in the infrastructure funding gap. And while P3s have been around for decades, cities are expanding partnerships with the private sector, even tying financial performance to environmental and social outcomes. In the county of Los Angeles – the most populous county in the US, with more than 10 million people – voters overwhelmingly approved a ballot measure to raise $120 billion to fund transportation infrastructure upgrades, such as bigger rail projects, better buses and improved highways. To make the money go further, Metro, the county’s transit authority, is opening the door to innovation by establishing a policy that allows the private sector to bring unsolicited ideas – ideas that might provide a better way of designing, financing, building or delivering the agency’s transportation services. It’s a scheme that can work. The city of Denver recently completed the largest transit-oriented P3 project in the United States – a $1.6 billion light rail line that benefited from sales tax revenue, federal grants and nearly $300 million in cost savings through private-sector innovation. The city hopes to extend the model to a $1.8 billion renovation of Denver International Airport and to reimagine its National Western Centre. While value capture has been used across North America and Europe, it’s relatively new in other parts of the world, such as Australia. Recently, however, it has been considered as an alternative funding approach there too, especially as Malcolm Turnbull’s government commits to investing a record $75 billion in infrastructure over the next 10 years. Value capture is a method of identifying and collecting the increased value of property or land near infrastructure services such as transportation hubs. It allows for the uplift in future land values in order to pay for infrastructure that otherwise couldn’t be traditionally bonded. A recent successful example that is often cited is in the UK, where the $29.6 billion Crossrail project utilized value capture from potential beneficiaries such as local employers and commercial property owners, to finance $7.6 billion or 26% of the overall cost. In the past year, a new financial tool has emerged that gives private-sector investors the ability to finance projects that tie rewards to measurable social or environmental outcomes. Environmental impact bonds, or EIBs, fit under the broad umbrella of green bonds and recognize the value of building sustainability and resilience into infrastructure assets. Unique to EIBs is their “pay-for-success” model, where a contract between a public entity and the private sector determines payment based on measured outcomes. DC Water, a water and sewage utility for Washington, DC, and Goldman Sachs pioneered the first EIB in the US in late 2016 to fund the construction of green infrastructure to manage storm water runoff and improve its water quality. In this particular EIB, the costs of constructing the green infrastructure are paid for by DC Water, but the performance risks of managing storm-water runoff are shared between DC Water and the investors. The Rockefeller Foundation, a private organization that focuses on building resilience and advancing more inclusive economies, is supporting the first publicly offered EIBs for two cities in late 2018. The Foundation is looking at cities, municipalities or government agencies that are interested in using innovative financing to pilot resilience or sustainable infrastructure projects. While cities must constantly stretch resources to deliver infrastructure in a faster, better and smarter way, there is a clear state and federal role in supporting these local objectives. At the US state level, California recently created an Enhanced Infrastructure Financing District (EIFD) model, arming its cities with greater taxing authority to support infrastructure development. 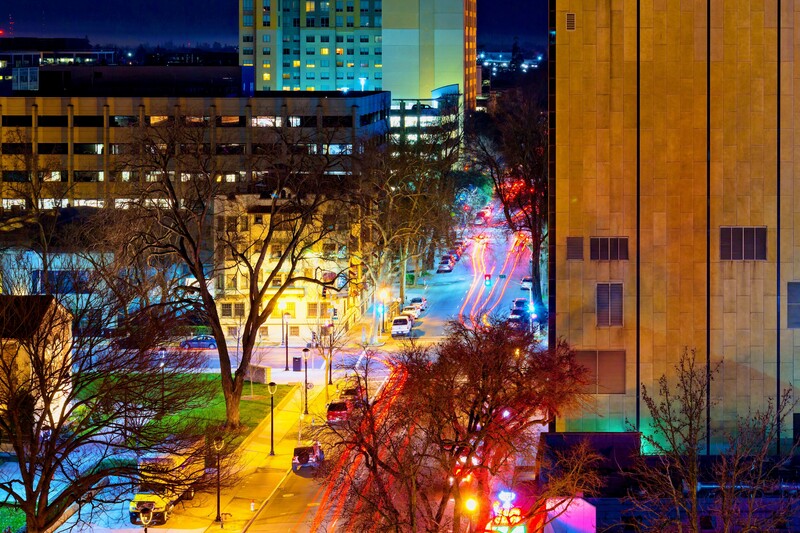 Through this new state taxing authority, the city of West Sacramento is currently working with the city of Sacramento to build the Broadway Bridge, which would connect the two cities, and potentially spur economic development. An EIFD will issue bonds secured by tax increment revenues to help pay for its construction. At the national level, the Canadian government has recently launched a C$35 billion Infrastructure Bank to help cities develop financing models and prepare projects for private investment. The government will bolster projects that may not be financeable by providing additional funding and taking an investment stake to reduce private investor risk. There is no magic bullet for cities facing extraordinary infrastructure demands. Keeping pace with technological changes, environmental and population shifts and ageing assets requires a major commitment to funding new construction. Cities have to expand their playbook or rewrite the rules when it comes to creating dedicated funding streams and leveraging private investment to spur innovation and cost savings, while accessing state and federal support. Please find the original article here .